Vineyards on three sides, sweeping lake view in front. 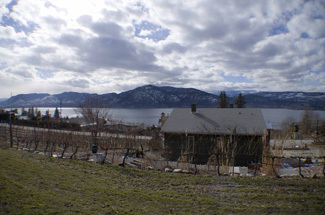 This low maintenance 1/3 acre on Naramata Bench is a rare affordable property in wine country. Stunning 180-degree view of Okanagan Lake, sunsets and Summerland lights. Beautifully updated older home with cherrywood kitchen, ceramic tile, Euroline windows, wood floors, newer heat pump. The dining room walks out to a 24x12 deck overlooking the lake and mountains. Two bedrooms on the main and a large third bedroom below. Master bedroom has a 2-piece ensuite. Separate entrance to the partially finished full basement - ideal for a secondary or guest suite. Bonus: infra-red sauna included. Low maintenance landscaping and ample parking for vehicles, a boat or RV. This is a great alternative to a condo!